Facebook just unveiled their Facebook for Every Phone app which will put a serviceable Facebook experience on even the crappiest of phones. 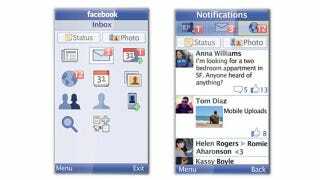 I'm not kidding, Facebook for Every Phone will work on over 2,5000 different devices. Basically, if you have a Java-enabled phone, you can get a Facebook app now (...and my iPad can't?). It might be dumbed down a little but you can still easily keep track of your News Feed, Inbox, Photos, Wall, and more by just downloading the app from m.facebook.com. Facebook has even partnered up with some carriers around the world to give people free use for 90 days.